Again, I’m late to the party because I overestimated the intellectual capacity of the alarmist loons. Steve wrote about this yesterday. To get you all up to speed on this. A little known blogger at WaPo (a guy named Andy Freedman) wrote a drive-by, character assassination piece on Drs Spencer and Christy. Apparently what set this small man off was a press release regarding the 33rd anniversary of satellite data from UAH(University of Alabama-Huntsville). The character assassin didn’t link to the press release, but only quoted part of it. I haven’t looked to see if it was an accurate reflection of the press release, given the history of these delusional twits, it is entirely likely Freedman has gotten it wrong in either context or content, and likely it would be intentional. I’ll put that on my list of things to do. The part of the press release that sent Freedman in a full fledged dissension into mental depravity was this little jewel…..
“While 0.45 degrees C of warming is noticeable in climate terms, it isn’t obvious that it represents an impending disaster,” says John Christy of UAH, who, along with Roy Spencer, has maintained one of the satellite-derived temperature records. “The climate models produce some aspects of the weather reasonably well, but they have yet to demonstrate an ability to confidently predict climate change in upper air temperatures,” Christy states in the press release. “As far as the data go, I don’t really trust the satellite data. While satellites clearly have some advantages over the surface thermometer record, such as better sampling, measuring temperature from a satellite is actually an incredibly difficult problem. That’s why, every few years, another big problem in the UAH temperature calculation is discovered. And, when these problems are fixed, the trend always goes up,” he said via email. The bolded statements in the above quote are demonstrably false. So, how is it that I know this isn’t about science and is about character assassination? History. Freedman isn’t a novice to climatology. He has several posts about climate. It is possible that he is delusional, but I don’t think one can be this delusional and still function as an individual. The same goes for Santer and Dessler. Here’s the problem with their statements. First, if they are all mentally deficient as it appears, they would have us believe they are unaware of the RSS data set. (The other satellite data set.) That they are unaware of Hansen’s algorithm which is constantly applied to the GISS data set. That no one, not even Jones can look carefully had HadCrut’s genesis. (The computer ate his homework.) 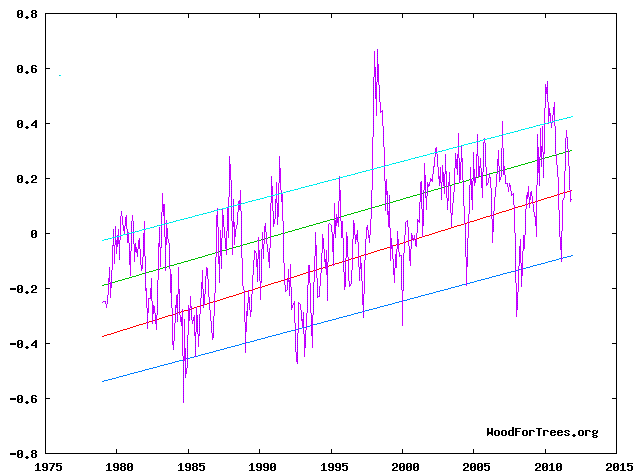 But, the most glaring bit of evidence as to why I know this is simply character assassination is that there is no discernable difference in the temp trends of the various data sets for the time period referenced. I used UAH’s data to graph the temps and then put UAH, GISS, HadCrut, and RSS’s trends from 1979 to present and then rearranged them. Can you pick which one is UAH’s? Can Santer, Dessler, Abraham or Freedman discern the two surface temp data sets vs the two satellites? How long will the climate community continue to associate with scumbags. These people are morally bankrupt. Because of this intellectual and moral vacancy, how is it that anyone can trust anything these people say? Go here to see a couple of brief responses by Drs. Christy and Spencer. Go here to get the highlights. Wow, decent participation, but no comments….. for the people that wish to know, the color code is as follows….. Red is GISS, Blue is RSS, Green is HadCrut, and Bluegreen(aqua…whatever) is UAH. Now, here’s a bit of irony. As I already noted, RSS has the same 33 year trend. However, this decade there’s been noticeable divergence in the various temp series. My thanks to commentator Robin for reminding. When will you Reveal All? lol, I guess I should do that….. I’ve got a buddy getting off work soon that says he’s looked at the data enough that he can tell…… when he gets home and e-mails me his answer, I’ll reveal…. about 15 min …. So why the divergence now, when it was not apparent before? BTW, the chart shows uah as green and red, and rss as blue/green? I got those graphs from http://www.woodfortrees.org/plot/ The colors of the lines will change depending upon which data set you choose first. In the instance of the first graph, GISS’s linear trend was first chosen so it get’s red. In the second graph, UAH temps was first chose, so it got red…… second is green…. and so on. It isn’t dependent upon what data set you choose, just the order you choose them in. It is a fun site, I highly recommend people going there and seeing for themselves. The guy that runs the site is agnostic when it comes to climate. It is a beautiful and robust app, and the data is linked to the sources and has been thoroughly vetted on both sides of the discussion. As to the similarities for the 33 yr and the divergence more recently,……. early in UAH’s history, they read lower than the others. Now they’re reading a tad higher…. I can’t be sure, but I think there’s a satellite malfunction of some sort that is causing this. Look for more howling when Drs Spencer and Christy correct this and come more in line with RSS. Conversely, were RSS to adjust their data upward, look for howling from the skeptics. It’s really strange. RSS is ran by alarmists and showing cooling. UAH is showing warming and ran by skeptics. In my view, those are real scientists, running both. I voted “It’s a trick” just for fun. lol, you and 4 others! The thing is, it isn’t the data that’s being called into question. UAH showed the most warming in the last decade. They are questioning the integrity of the scientists based on nothing other than their skepticism. A trait all scientists should have. Their critics have to invent crap in order to criticize Spencer and Christy. I think they’re pissed because if alarmists were in the positions Spencer and Christy are, then they imagine they’d have free reign on all the data. I too collect and analyse climate data sest. Have done so for the last 17 years or so! One important difference between my analyses and those that I see on blogs and in “the literature” is that none appears to show “confidence intervals” for the fitted Least squares lines (or curves, if they have chosen a second or third order model). My software does this. Don’t know how to publish a plot here, I’m afraid, but would be able to send a GIF attachment by email. CI’s are rather interesting if one thinking in terms of making projections about future events. Typically they show that projections are worthless. (We knew that already, I suppose). Is there a compact source for all the data sets you’ve looked at? Mine all seem to come from various sources. |Currently I’m in an email exchange with the UK Met office about their graphical presentations of Hadcrut3, which I find rather misleading (to put it delicately). Their fitted plot continues to show a sharp increase, right up to its latest value. They tell me they use a 21 year Gaussian filter – and I asked if that was because they wished to disguise the current “flatline” – which has lasted for more than 15 years! I would be happy to have an email from you. And a some other stuff as well. Here are some of the things one can do with the data…. For novices to his site, I highly recommend exploring each tab. It’s worthwhile. For graphs which carry a different appearance, odds are I’m using MS Excel. Many thanks, suyts! I’m looking forward to your email. The software I use was developed by me, mainly in the 1980s-1990s. It is a wide ranging stats system with loads of functionality, written in BBC BASIC – of which you have probably never heard. Runs under RISCOS, an operating system developed originally by Acorn Computers, but abandoned by them in 1993 I think, when they decided to concentrate fully on ARM chips (Acorn Research Machines), and these chips now power about 90% of the world’s cell phones, I believe. But there’s loads of other functionality, and I’ve sold it in the UK quite successfully, as a hobby business. Multiple regression is quite comprehensive, with robust methods, non-linear least squares – too much to go into! Will probably go fairly quiet over the holidays. Greetings to everyone. Paul, I think that would be a huge step forward if you guys would be able to incorporate CI’s. I’m not into prognostications, but many others would like to see something of that nature. You’re going to have to build a “tip jar” button. Outstanding! I’ll see what I can do to let people know! Happy New Year! And yet, you’ve no link to it on your http://www.woodfortrees.org/ site? Yes, from the main page (right hand sidebar) and also in a link below every graph! Ahh, there it is! I’m doing a cursory vetting of the organization now. Right, it doesn’t appear to be. There were some tree planting and preservation projects in Africa and Central America, which have had disastrous effects. They mostly have to do with carbon credits and the U.N. For skeptics, this would be a great concern before donating to an arbor type of charity. For a few examples of contention, go here, here, and here. I just listed those so you can understand what I meant. As far as I can see, The Woodland Trust has no connection. lol, Paul you were going to be a first for me. I have never donated to a foreign charity before. But, for your altruistic efforts at WFT, I would make that exception. Sadly, MasterCard’s security features have kept me so safe, I can’t seem to circumvent them. I’ve forgotten my security code 😦 Will try again in the near future after I get this fixed. Sry, I wanted to be first. Despite being retired the holiday season has put plenty of demands on my time, so have not yet properly thought about how to get my code across to you., The major problem is that it is heavily embedded in the general code, making use of my data storage system, matrix operations, graphics code and so forth. I shall try to sort something out, but can’t do it immediately. I also need to resurrect my thinking from the late 1970s, which gets harder by the year! Will be in touch in due course, and I’ll email with some graphics examples. We’ll look forward to it! Hello, Paul, Yes, you are right about needing the “t” tables. It will be no problem for you! I developed very good (dare I say excellent?) approximations for the usual standard probability levels in 1978, using, and for use on, my Commodore PET. Rational functions, merely a line of code each, and I’m happy to “share” them. 99%, 95%, 90% and 80% are all available. In my S/W you can choose the level you want, but it’s not necessary for most people because they are content with 95%. I have never fathomed out why. So, when things have subsided here I’ll look them out. Are you in the UK? I’m in Bromsgrove. I would rather send the code and code fragments as an attachment. Some is ready. For other sections I have to do a bit of digging. Yes, I’m in the UK, down in (windy, wet) Cornwall. My e-mail is paul at the obvious domain. Nice bit of cherry picking there I see. I guess agw must be a scam. I guess your ability to discern what the post was about is lacking. What was picked? The first graph of the total sat data, or the divergences we’ve recently seen? Or, are you just babbling nonsense as must AGW supporters do?